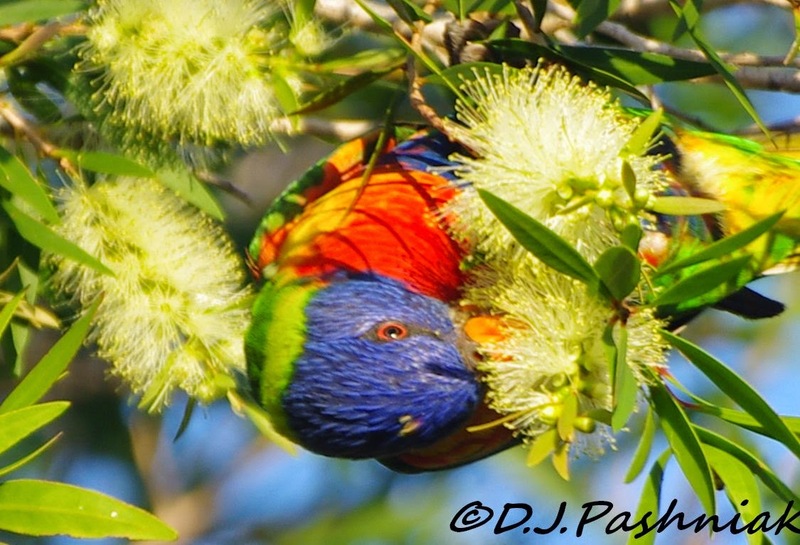 The other morning I heard a small flock of Rainbow Lorikeets settle down in the Callistemon trees in my backyard. 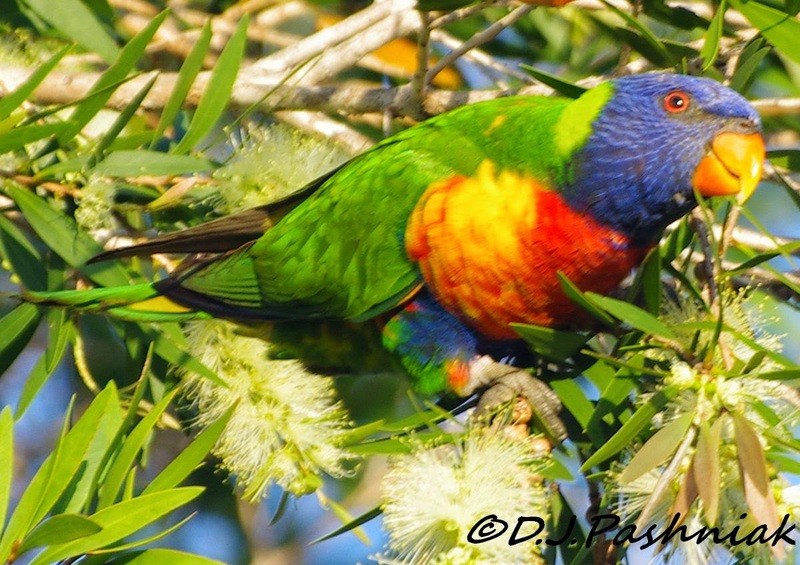 I used to have Lorikeets in the yard all the time but then the Grevillea trees broke and had to be removed. 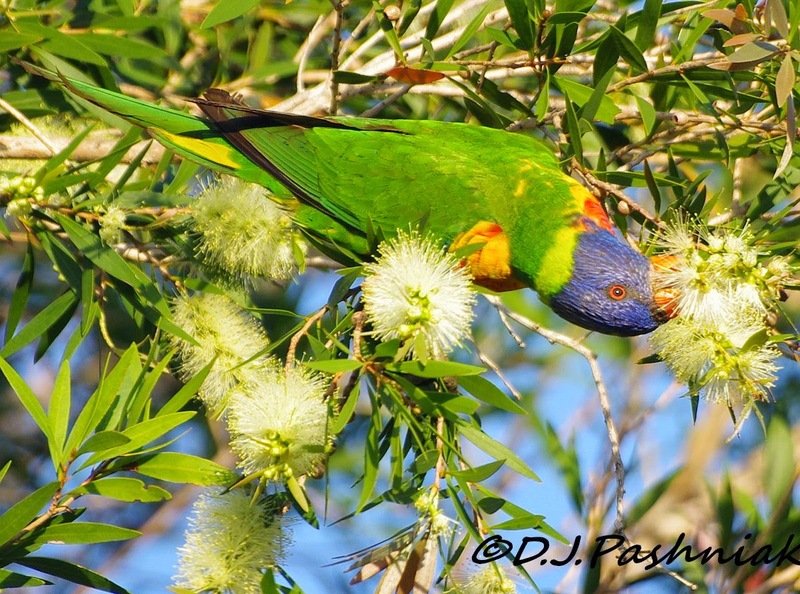 I haven't yet replaced them and the Callistemons don't flower so prolifically or so frequently - so fewer Lorikeets than I used to see. I planted Callistemons down the side of my property. Some of them didn't do well and have been taken out but others have just kept growing - and growing! The tops are a bit scraggly but they still flower. 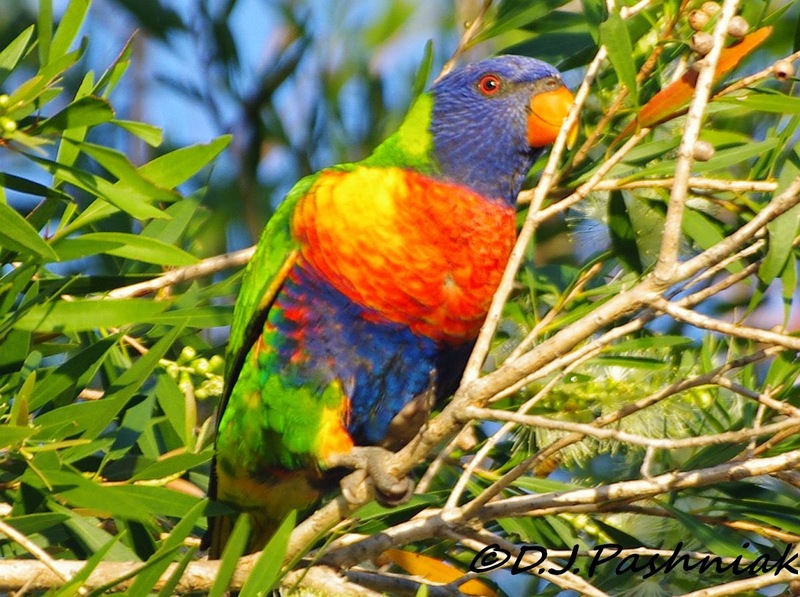 I photographed the Lorikeets on a beautiful sunny day and should have taken photographs of the trees at the same time. 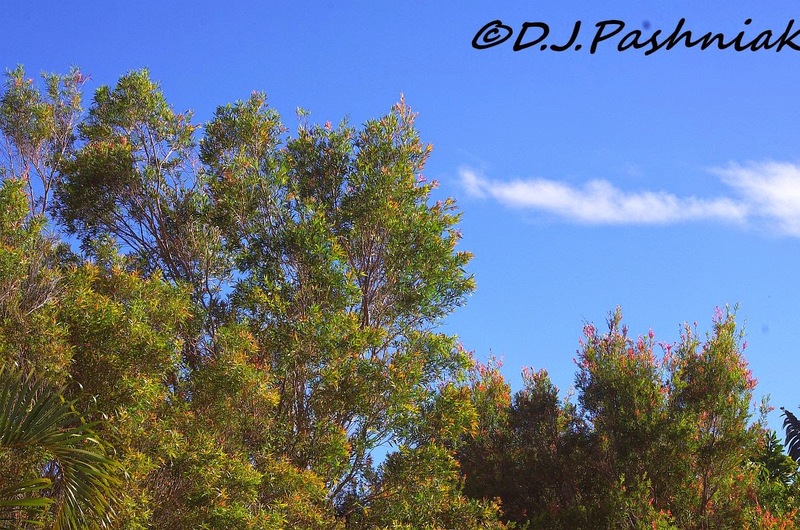 Instead you will have to imagine blue skies instead of cloudy grey skies. Very Late Addition: The sky is blue this morning and I couldn't resist getting a better photo of the callistemons! 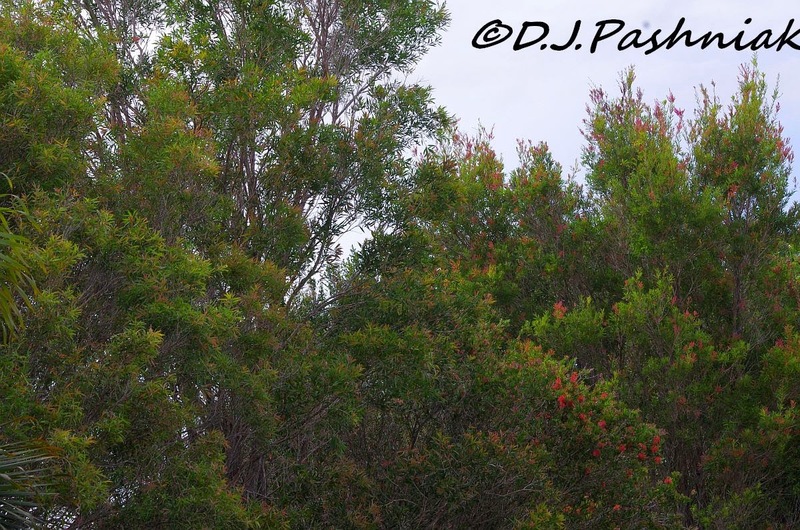 Lorikeets were climbing all over the tops of the trees. 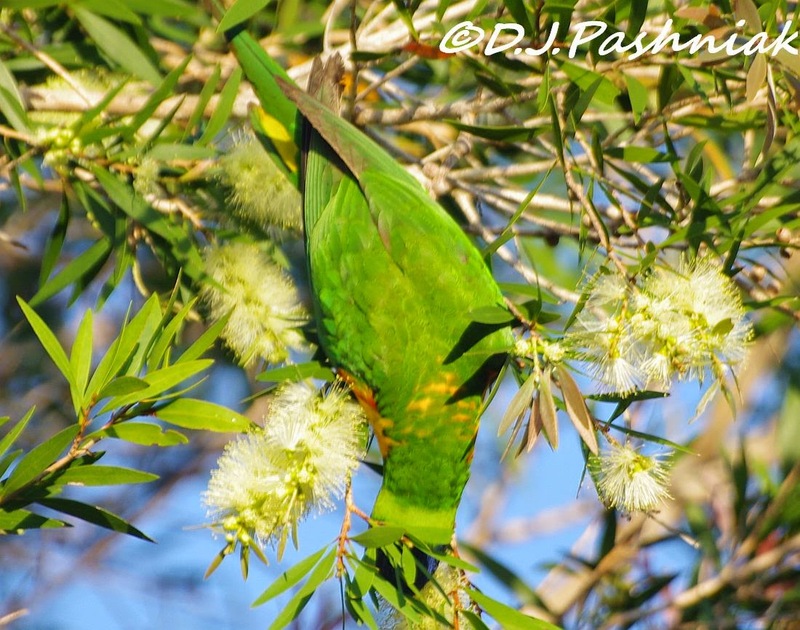 Their green colored backs make them harder to see until they move and show the lovely rainbow colors. I enjoy seeing my favorite birding place in all kinds of weather. 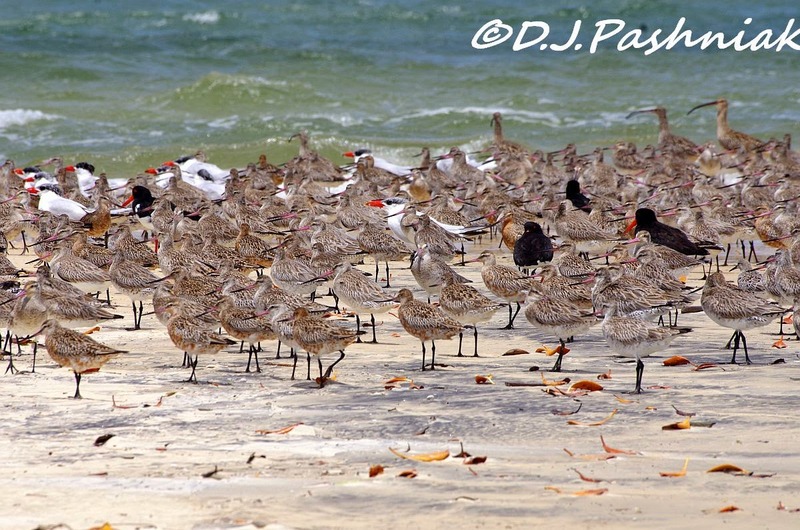 A few years back I would even fight against a choppy wind to get out there and see what birds were around. I haven't got that kind of energy now! However, I still like to get out there in less than perfect conditions. 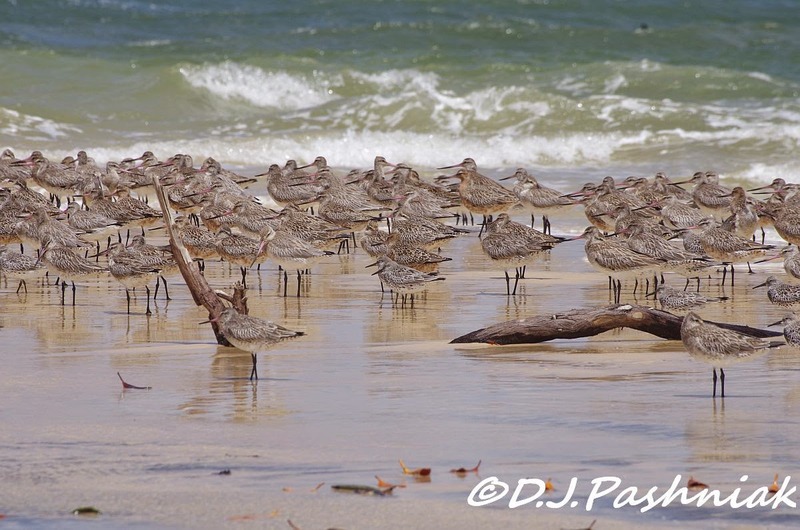 We have had long stretches of weather where the temperatures have been high but the winds have been high too - and high winds are not good for taking photos from a kayak or even for holding binoculars still enough to get a good look at the birds. 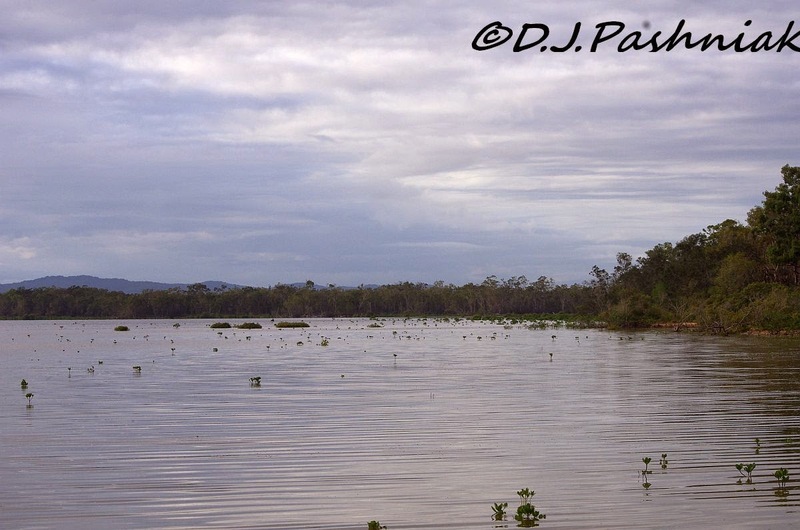 The other morning there was an early high tide - almost no wind - and I simply ignored the big clouds rolling through. I was on the water well before 7am. 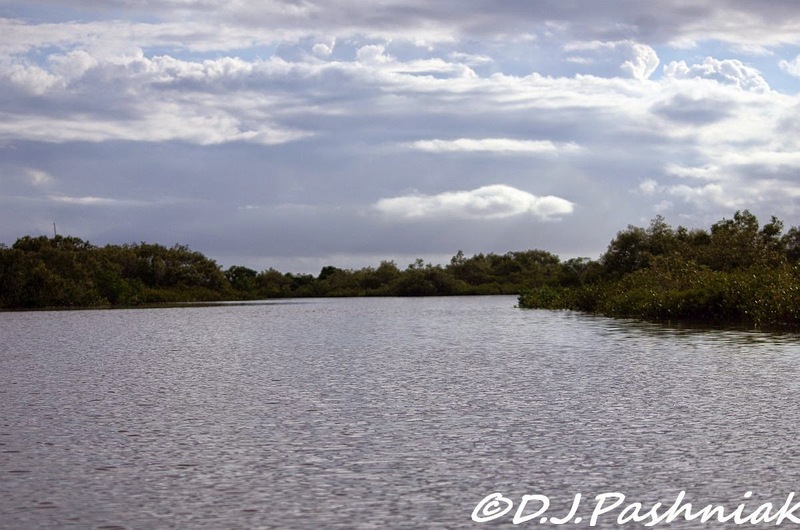 There was plenty of light but the heavy clouds made the water dark grey and nearly black in close to the mangrove trees that line the creek. 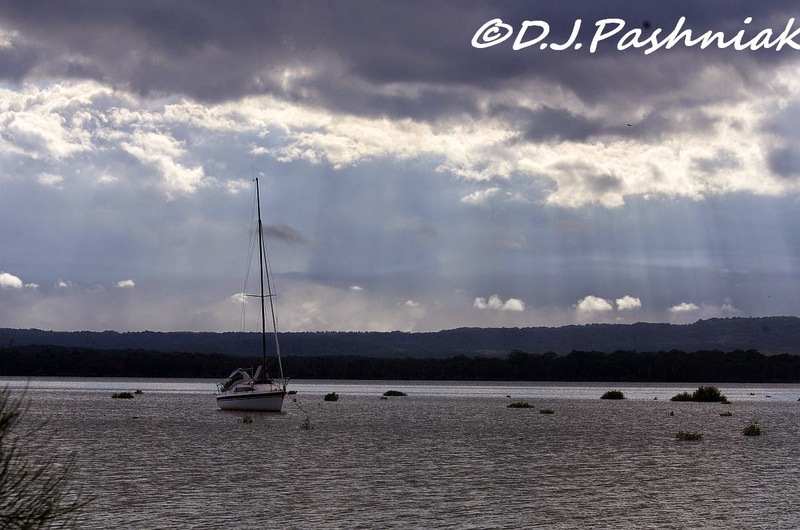 The light glinted silver off the water but didn't make the scenery much brighter. The Grey-tailed Tattlers seem to have found a roosting tree where they can see east over the bay but also north over the creek where I paddle out. Before I could get around the point they were calling out their annoyance at being disturbed and then took off for the other side of the bay. 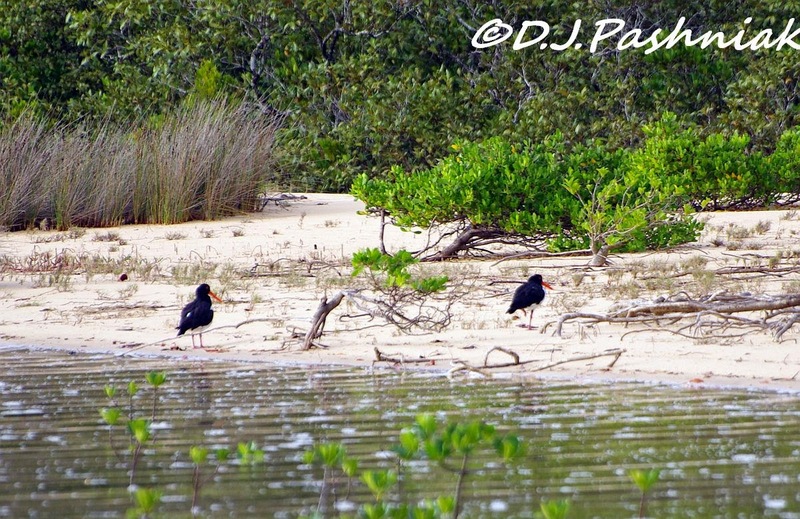 The pair of Pied Oystercatchers were there but slowly walked off to the other end of the beach. 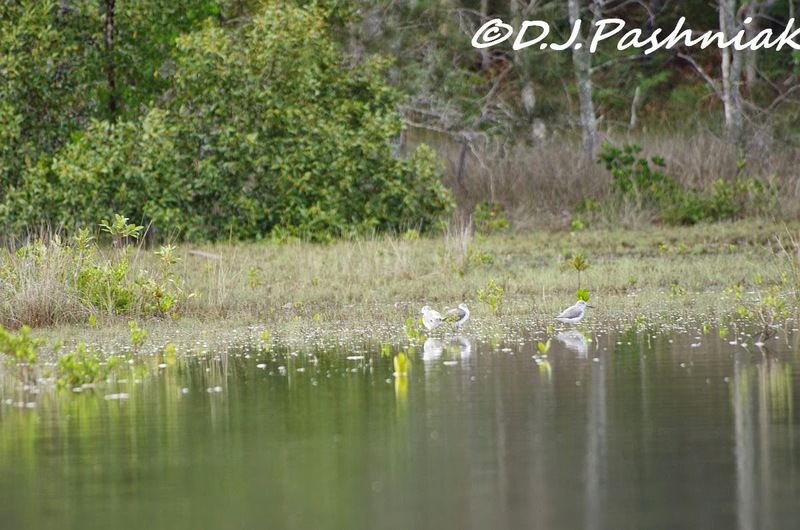 A group of Common Greenshanks flew off when the Tattlers took off but did not go right over the bay. I paddled back towards the car park but then paddled up the creek to see if there were any birds roosting on that low swampy part. The creek looked very dark even looking towards the east. 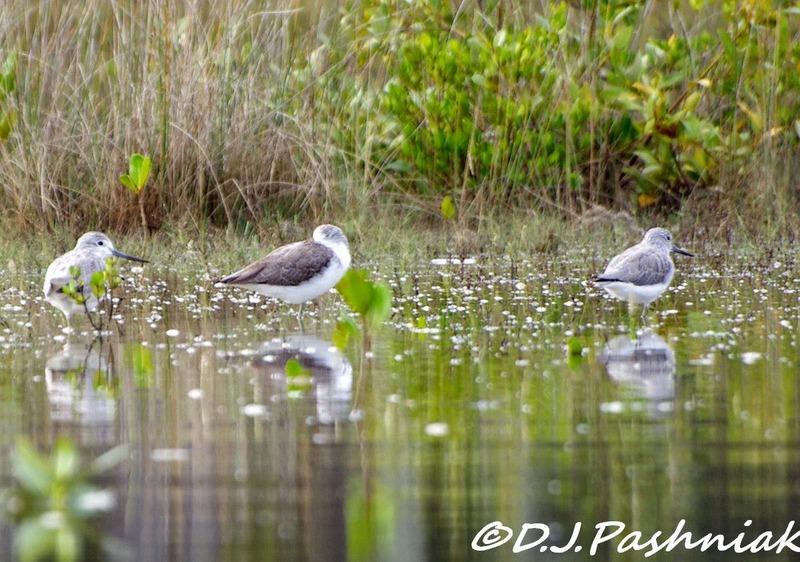 There were birds on the low swampy bank and as I got closer I saw they were Greenshanks but it was impossible to get close to them. Even in grey overcast conditions like this I enjoy this part of the bay. 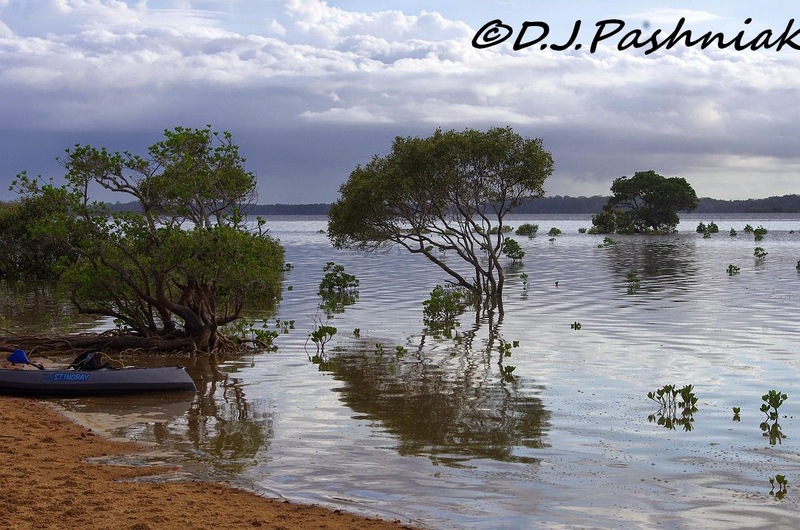 After the extreme weather conditions out at Inskip (which I posted about last time) I was very anxious to get out there again as soon as possible. By Monday of last week the main roads were only just beginning to open from the floods and I assumed that there would be very few campers out at Inskip - and that meant more room for birds out on the sand point. 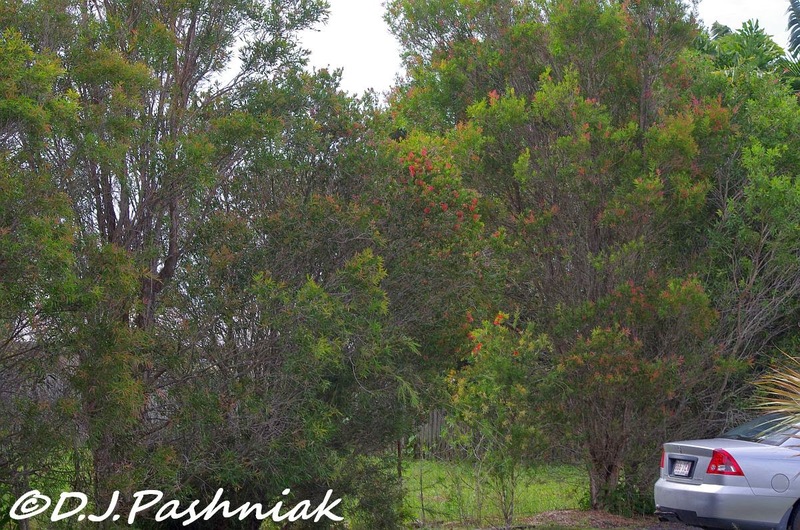 It didn't take any persuading for birding friends from Gympie to join me! 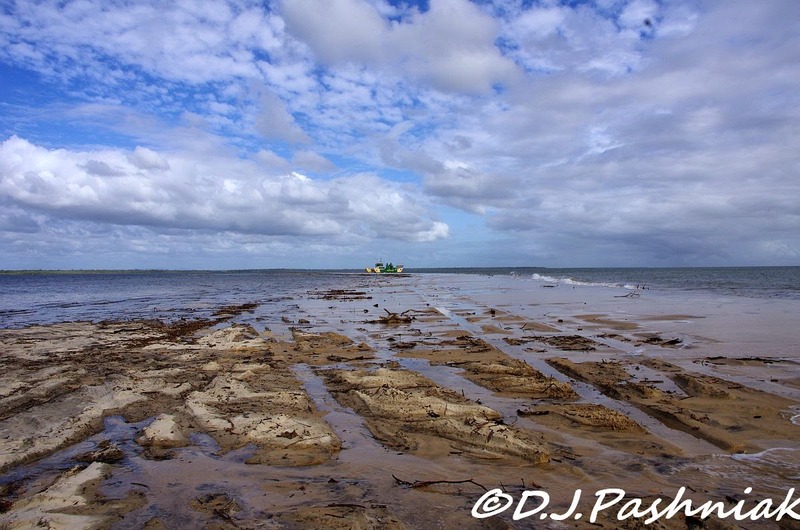 The sand point used to be much longer and the barges to Fraser Island came in and picked up vehicles part way along - which left the last part for use by the birds. 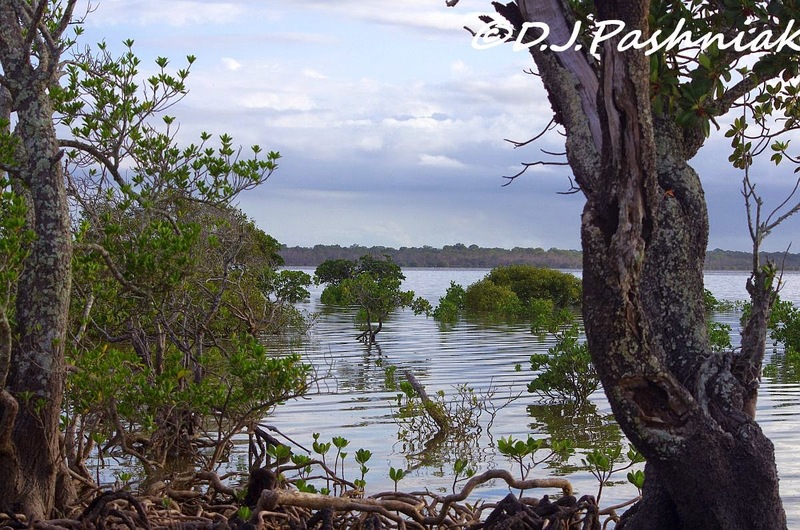 Here is a photo from my archives of what the sand point looked like on a high tide back then. The barges were working on Monday morning but there were very few vehicles and we could see birds out on the end to one side of the barge. 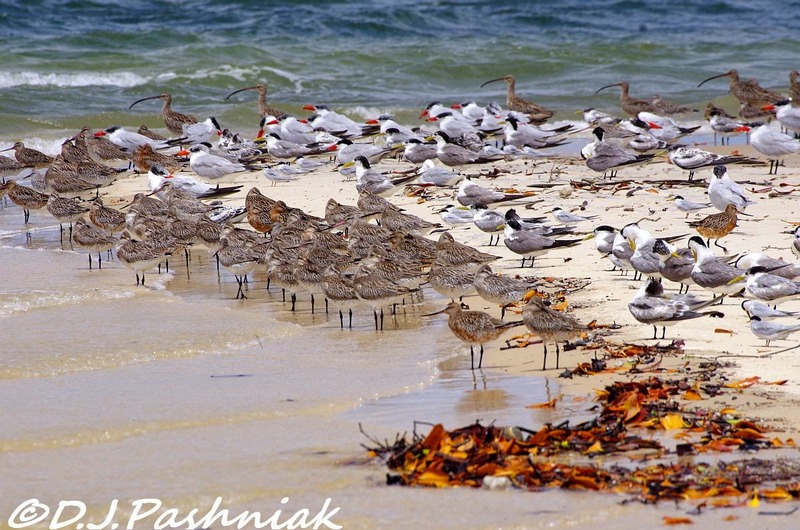 We slowly walked out along the sand and the closer we got the more birds we could see. At that stage there were no other people out there and no cars even waiting for the barge. Perfect! 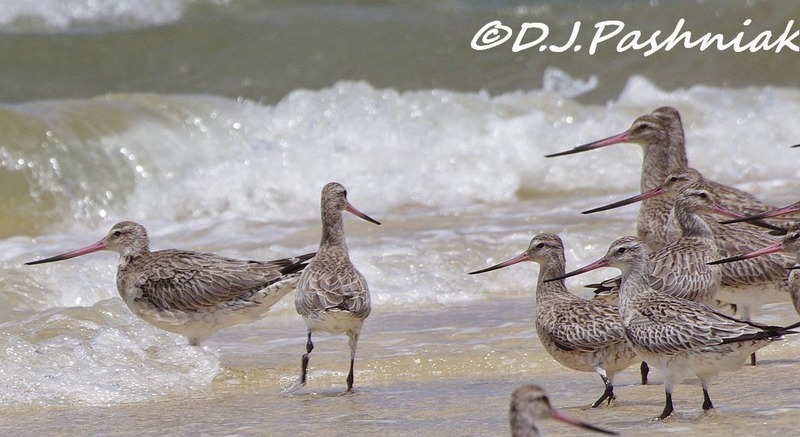 Here are the birds at the end of the point - Bar-tailed Godwits, Silver Gulls, Caspian Terns and Crested Terns. 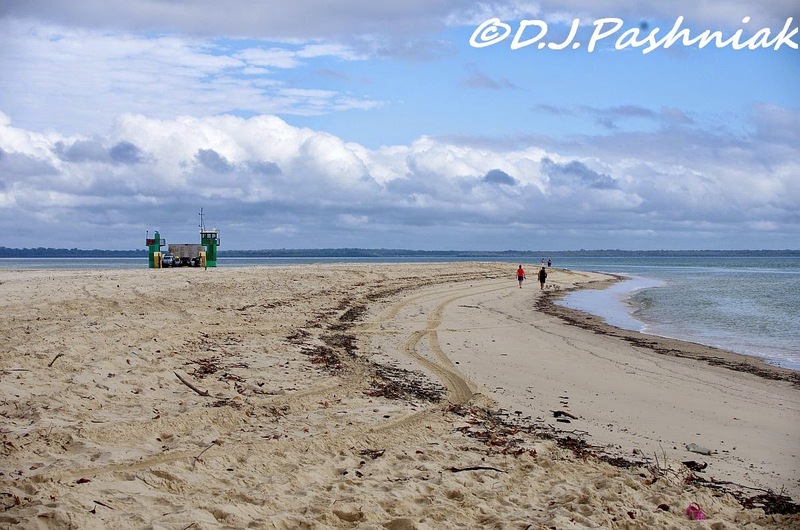 The tide was still coming in and there was not much of the sand island left in the middle of the Strait. More and more birds had to move from there and they spread out along the tide line on the point and then moved to join the larger group right at the end. The birds packed in more tightly! 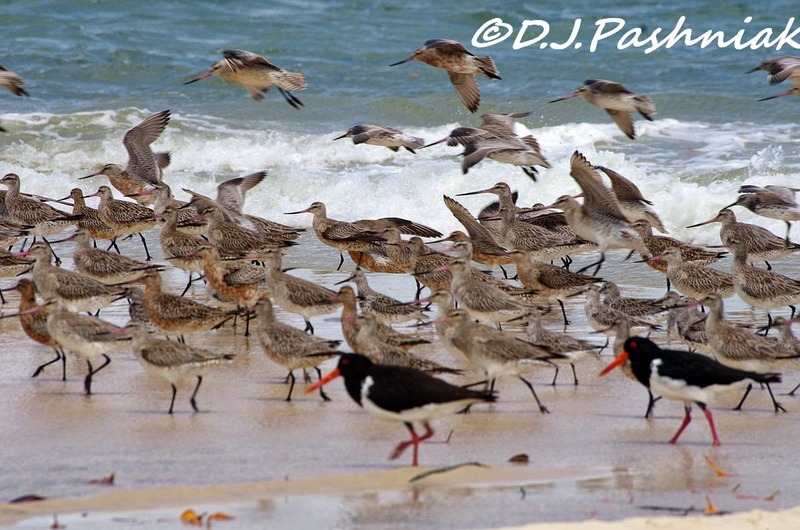 There were quite a number of Pied Oystercatchers with them. Then the inevitable happened - a group of vehicles came along the point to wait for the barge! The people in the vehicles all jumped out and they were young foreign tourists. They were very polite and didn't try to get in front of where we were standing with our big cameras and lenses! They were all holding up smart phones and trying to photograph the birds with those! Then I guess it was also inevitable - they decided they needed "selfies"! It was all so exciting! They moved away from us a little bit - then danced happily closer - and the birds started to fly! 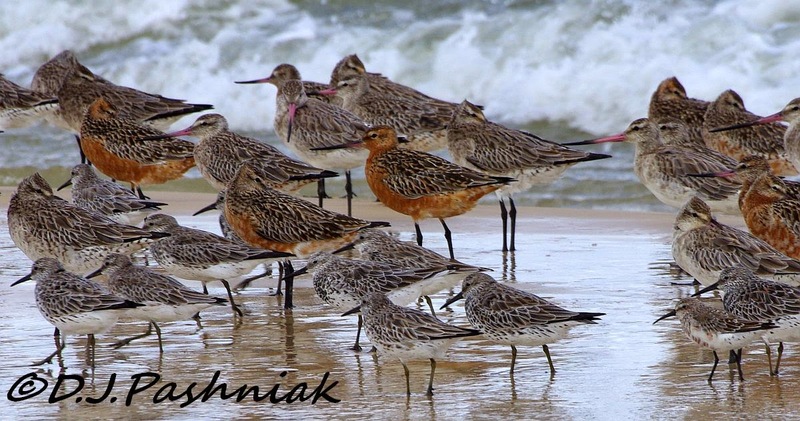 We were still left with quite a lot of birds to photograph but I estimate that two thirds of the flock flew off to find somewhere on Fraser Island to roost more quietly! It was interesting to see that the birds really didn't want to burn up the energy necessary to fly - and even put up with small waves washing around them. 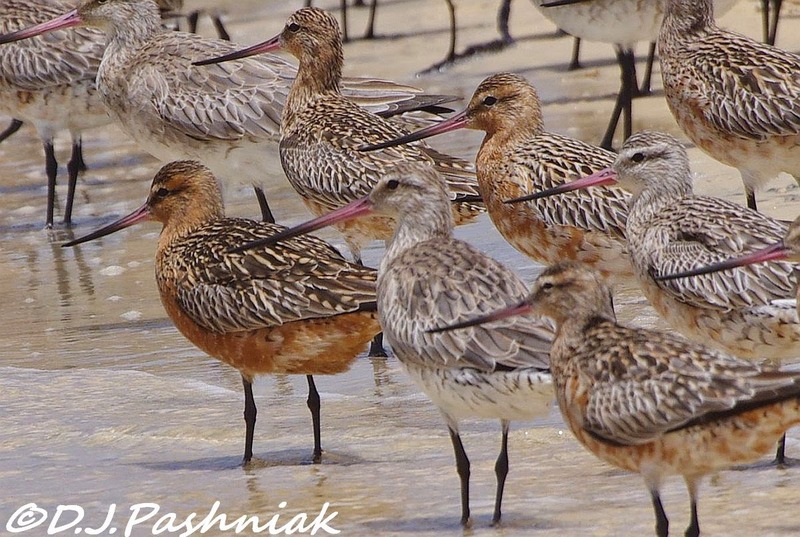 The flock had some Godwits with most of their breeding plumage. Looking carefully at the birds I could also see Great Knot with the start of their breeding plumage and one or two Curlew Sandpipers with the first faint wash of color. There were good numbers of Terns roosting close together and beside the shorebirds. 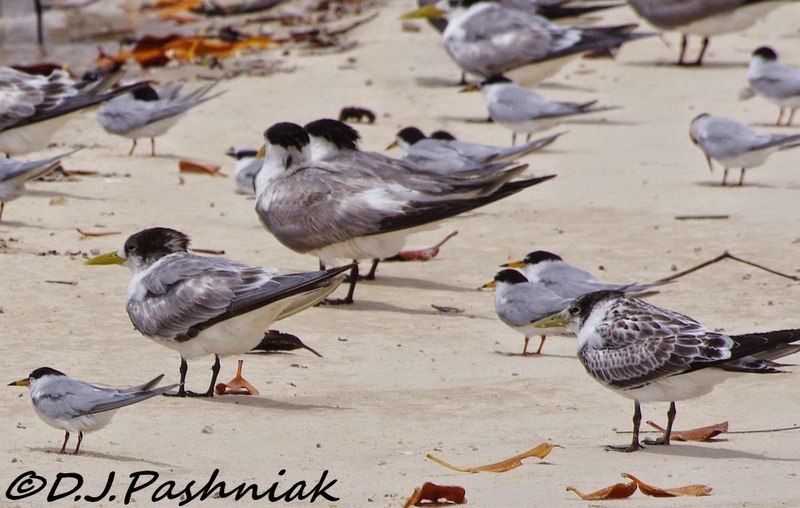 There were adult Crested Terns and juveniles with their distinctive "spotty" plumage. There were also quite a number of Little Terns and they were showing the yellow bills and black tip which they get before they fly up north to breed. 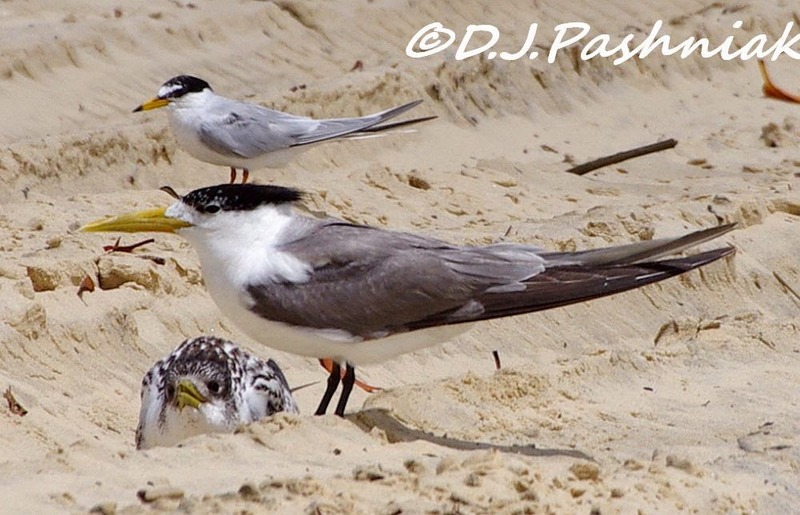 In this photo the juvenile Crested Tern is crouched down beside the adult and begging for food. (They are quite capable of feeding themselves by this stage but they still try to get the adults to help them!) There is a Little Tern behind these two.